Product #18120 | SKU AKP11US | 0.0 (no ratings yet) Thanks for your rating! 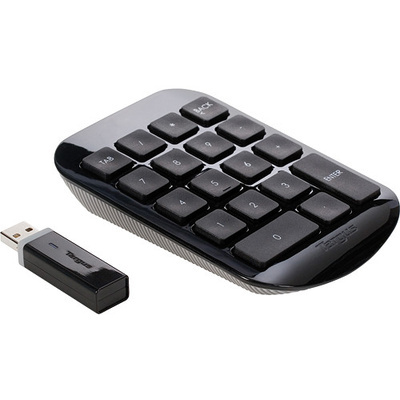 The Wireless Numeric Keypad from Targus is a compact external USB numeric keypad, designed for use with computers that don't have a dedicated numeric keypad as part of their keyboard. The wireless device includes a USB receiver, with 10 m operating range, for computer connectivity. When not in use, the receiver stows inside of the keypad for storage and transport. It allows you to more easily enter data into spreadsheets and other documents that are rife with numeric values. It features full-size 19mm keys, which improve speed and accuracy when keying. Its ergonomic tilted design reduces strain, even when using the keypad for extended periods of time.